Carrstone Cottage01263 715779work01603 870304fax Self-cateringLocated in the delightful village of Grimston, Carrstone Cottage is warm and welcoming and has everything you need for a great holiday. Originally a farmworkers cottage, detached and with roses around the door, the cottage is full of charm and character. The spacious bedrooms and bathroom on the first floor are accessed via a traditional, steep Norfolk winder staircase, whilst downstairs there is a comfortable sitting room with woodburner, a modern kitchen/breakfast room with a range cooker and a separate dining room. The kitchen door leads out into a lovely sunny enclosed garden and patio with enough space for the children to play, the dog to run around and the grown ups to relax and cook up a summer supper on the barbecue. With so much to do in the area, you are spoilt for choice; with cycling, horse riding, woodland walks, sea fishing, trout lakes, castles and grand houses, golf, lovely sandy beaches and birdwatching at the RPSB Snettisham Reserve there is something for everyone, not forgetting the village's own luxury hotel, Congham Hall, where you can chill out in the day spa or celebrate a special occasion with a luxury afternoon tea or dinner. • Heating: O.F.C.H, included May-Sept and £10 per week Oct- End Dec 2019 payable on booking. Heating included for 2020. Woodburner, electric living flame fire. • You may need to pay an Accidental Damage Deposit or Accidental Damage Deposit Waiver for this property. Where applicable we will contact you in good time before your holiday with further details and to take payment. Located in the delightful village of Grimston, Carrstone Cottage is warm and welcoming and has everything you need for a great holiday. 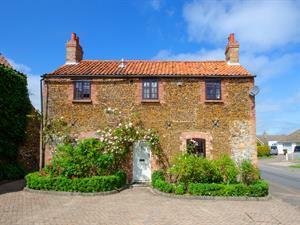 Originally a farmworkers cottage, detached and with roses around the door, the cottage is full of charm and character. The spacious bedrooms and bathroom on the first floor are accessed via a traditional, steep Norfolk winder staircase, whilst downstairs there is a comfortable sitting room with woodburner, a modern kitchen/breakfast room with a range cooker and a separate dining room. The kitchen door leads out into a lovely sunny enclosed garden and patio with enough space for the children to play, the dog to run around and the grown ups to relax and cook up a summer supper on the barbecue. With so much to do in the area, you are spoilt for choice; with cycling, horse riding, woodland walks, sea fishing, trout lakes, castles and grand houses, golf, lovely sandy beaches and birdwatching at the RPSB Snettisham Reserve there is something for everyone, not forgetting the village's own luxury hotel, Congham Hall, where you can chill out in the day spa or celebrate a special occasion with a luxury afternoon tea or dinner.